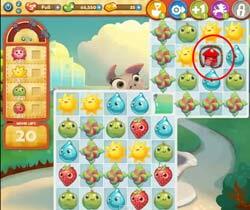 These Farm Heroes level 483 cheats and tips will help you beat level 483 of Farm Heroes. The objective of Farm Heroes level 483 is to collect 25 strawberries, 75 apples, 50 suns and 11 flowers in 20 moves. Try to get the flowers out of the way first. You collect the flowers by making three moves adjacent to them. That means removing the flowers also gives you a lot of chances to make matches with your cropsies. The level starts off with a fireckacker on the board, and more will drop down as the level continues. To set off the firecracker, like the flower, you need to make three matches adjacent to it. When the firecracker goes off, it will collect random cropsies on the board, but many of them. If you’re lucky, the firecrackers will collect some flowers for you, making your life a lot easier. If you get stuck with a stubborn flower or need to scoop up a lot of cropsies quickly, don’t be afraid to use the bonuses. 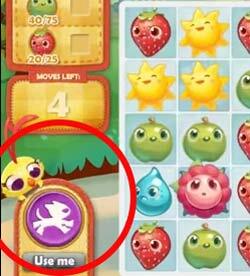 You should most often use the bonus that the game is suggetsing that you use. If it’s not suggesting you use one, then take your pic!